Buckingham Mystery: Shady Grove | slate river ramblings . . . .
Virginia Memory, the online digital collection of the Library of Virginia, is a treasure trove for anyone interested in primary resources concerning Virginia history. 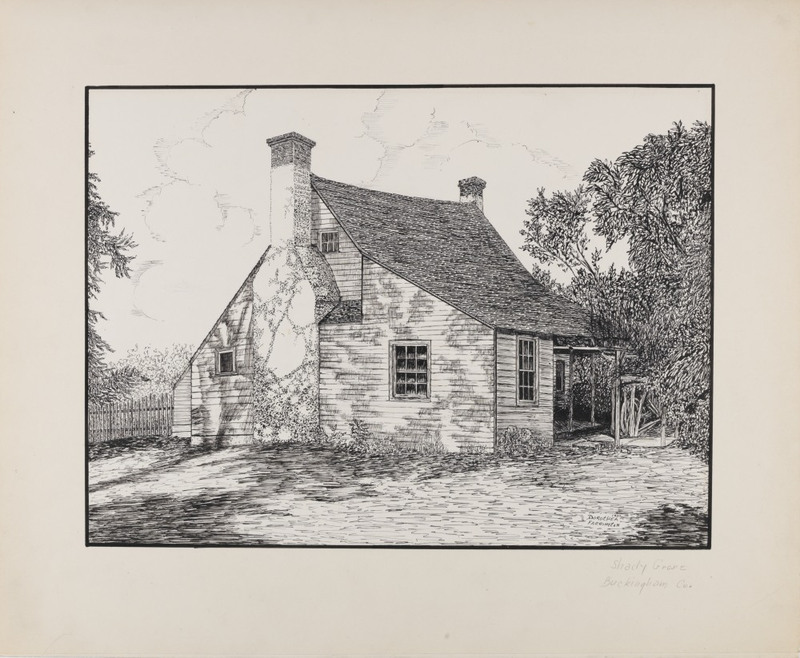 The selection of WPA Historic Houses Drawings created as part of the Works Progress Administration’s Federal Art Project in Virginia includes a pen and ink drawing of “Shady Grove” in Buckingham County. It was drawn by Dorothea Ann Farrington in 1937. Does a Slate River Ramblings reader know more about the house, Shady Grove? Know more about the artist? Mary, Many thanks for the link about Dorothea A. Farrington and her work for the WPA. Her sketches are lovely. If only she had captured more of Buckingham County. . . . Per the internet, Shady Grove was built in 1825 by Paulina Cabell Henry on land inherited from her father, Dr. George Cabell (of Point of Honor, Lynchburg, VA). Bill, thanks for your comment. The Shady Grove built on Cabell land was/is in Campbell County. It is a lovely brick house with an English basement. And, so, the quest continues for information about Buckingham County’s Shady Grove. Here is a link for more information about the Cabell-owned property. I did a search for “Shady Grove” and “Buckingham,” and what I posted is what was displayed by Wikipedia. I now see, however, that the word “Buckingham” was on another part of the same page, and that is why the “Shady Grove” in Campbell Co., VA was shown, despite my “search criteria.” Sorry for the error. Shady Grove reminds me of the home of Ed Ayres…. shape, little windows. I think I’ve asked him about this, but… if I did, I don’t remember what he said…. I followed up on your hunch. Ed Ayres felt that Shady Grove was not his family’s home.